Walter Start is at the top of the tree professionally and in December 2003, to mark 50 years managing the Froyle woodlands and 56 years in the forestry industry, a new wood was planted in his name. Woodland Heritage has planted the two-and-a-quarter acres of oaks (Walter’s favourite tree) on land belonging to the Froyle Estate in honour of the 79-year old’s half century of woodland management. Walter cuts the tape to open his deer-proof plantation. 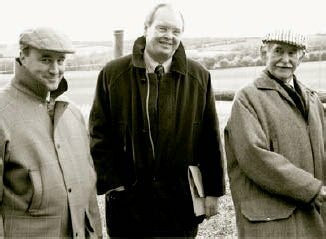 Paul Lindon of Smith Woolley (managers of the estate) joins Lewis Scott (centre) and Walter for the opening ceremony. Walter came to Froyle with his wife Mavis in 1953, when he was given the job of forester on the 3,000-acre estate, which was then owned by Lord Mayor Treloar College. With about 600 acres of unmanaged woodland, Walter had his work cut out. "Nothing had been done on the estate except felling mature trees. There was no replanting or anything like that, so in conjunction with the Forestry Commission I drew up a management plan." That plan included which trees to keep, which to fell and a replanting strategy based on the form of the tree, its age and size. Since those early days, Walter has carved out a fine reputation in the world of forestry in North Hampshire and he’s served on numerous national and regional forestry committees, won a number of prestigious awards for his work, among them several for woodlands planted in Froyle and one for work at Noar Hill near Selbourne, and since 1971, he has been in demand as a forestry consultant. In 1983 he was awarded the MBE for his services to forestry and the recent tribute is a further indication of the great respect he enjoys. "I feel it is a great honour and I didn’t really expect it," he says. The Froyle Estate, now owned by a private trust, is used regularly for shooting and Walter’s forestry plans always take into account the interests of the sport. "I work closely with the keepers over the layout of young wood, woodlands rides and I co-operate with the head game-keeper on where release pens are to be. There’s no tension between us. It’s much easier to co-operate than to argue. I know what he requires and he knows what I want." Although less hands-on these days, Walter is still very involved and recently worked with the Forestry Commission to draw up a 20-year plan for the Froyle Estate woodlands. Offering the chance for more continuity, it was, he says 18 months of hard work but a very worthwhile exercise. "I’ve never got up in the morning dreading to go to work. It’s a vocation and I love and enjoy what I do." Walter will never retire - it goes against the grain.